To keep your address details private, Sendle offers you the option to hide your street address on the label and in tracking information. Before opting in for this it's worth considering that in the event a parcel needs to be 'returned to sender', hiding your address could result in a parcel not being returned to you if the label is damaged and your details can not be established from the barcode or label number. 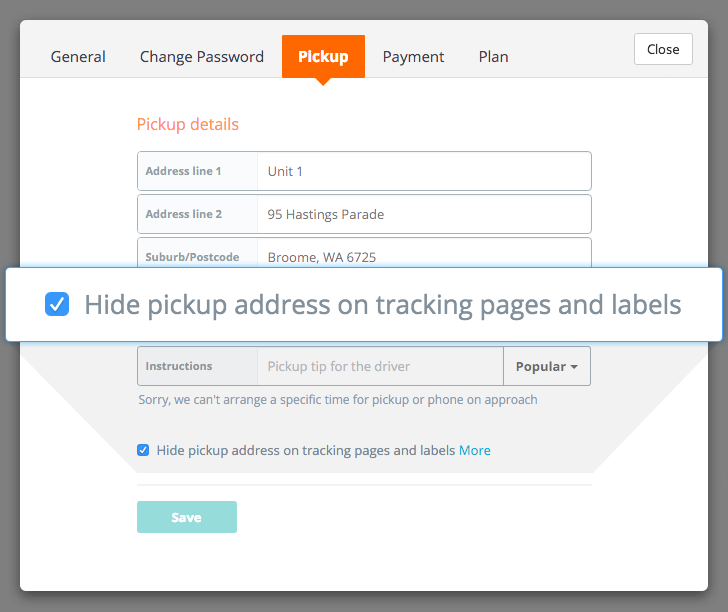 Just tap "Hide my address" in the pickup tab in your account settings, and your address won't show up on labels or public tracking — great if you're sending from your home address! Once you've selected this your street address will be hidden to the receiver and only the pickup postcode and suburb will still be visible on tracking pages and labels.